After taking 6 times other varieties, everytime splitting the bag in half with a friend, we both really wanted to try higher doses. 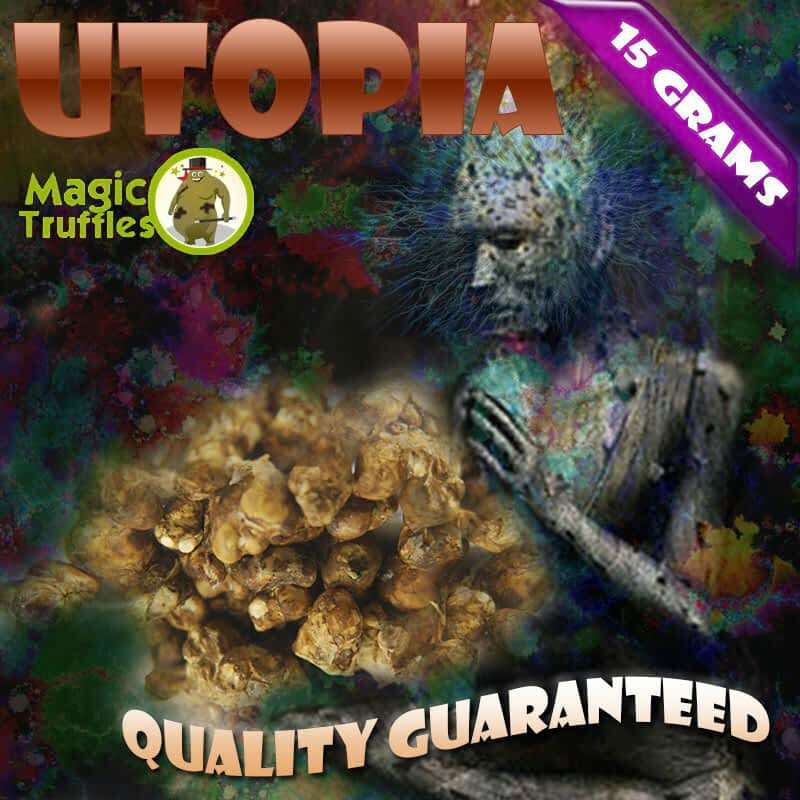 We took these Utopia truffles splitting 2 bags for 3 which was about 12+ grams each. It was an afternoon in late july 2018, we were in a very pleasant place : a large clover field surrounded by a forest, with a nice lake next to it. The place you decide to take your truffles is very important and really affect your magic trip, so make sure to chose well. We chewed the truffles for 10 mins and sat in the cloverfield with some cool music, waiting for the first effects to kick in. After 35mins, my friend told me things arround him started moving and twisting a little bit. Usually we both get these effects at the same time, so I was a bit nervous when I saw he was starting to trip before me lol. However a few minutes later, it really kicked in. I got really strong nice visuals that I never experienced before, while for my friends it wasn't that strong. I can't really put words on what I lived. It felt amazingly good. The music was so damn good rithm. Looking at the clouds was insane, same thing when I decided to close my eyes and play with brightness with my hands. Moving to the forest was amazing. I saw a snake made of the colorful leaves that where all over the ground. My friend was a freaking hermit with his wood scepter and his t-shirt on his head hahaha. The other was somewhere next to us in a really "thinking" mood. I also got this moment of deep thinking, sitting in the forest in front of a large piece of moss and talking to myself. After something like 2 hours of intense tripping, we decided to go to the lake. The effects were slowly getting lower at this time. It's amazing how you keep control on reality with utopia truffles while being in another world. The lake was also great, really refreshing. We played like kids with the water and rocks. This moment was a lot of laughter. Looking back to it, this trip was really varied in its effects. For me it was an awesome experience with this dosage. However, my friends did enjoy the trip but they did not notice a strong change going from a 8g dosage to a 12g dosage. And we have all the same morphology, really similar in size and weight. I say that because I think your reaction to this product may differ because of many factors. Also we were obviously on an empty stomach. Just experiment progressively and find what works best for you. Really great trip overall, can only recommend. Hope you'll find it useful. Thank you again Buy Magic Mushrooms, your service is a 10/5.